As a follow up to the visit by Chinese students to Iowa County, here is a nice article about this fun and valuable visit. The article is written by Jean Berns Jones, and was published on the front page of the Dodgeville Chronicle. Thanks to the Chronicle for the great coverage. There is a direct link to the original article and their advertisers (all friends of mine!) below. Please patronize these good Chronicle advertisers. I am re-posting here so I can include the fun group photo of the visit. I am especially glad for the article's emphasis on the good words of incoming Chinese President Mr. Xi Jinping about his memories of living in the Upper Midwest as a foreign exchange student. 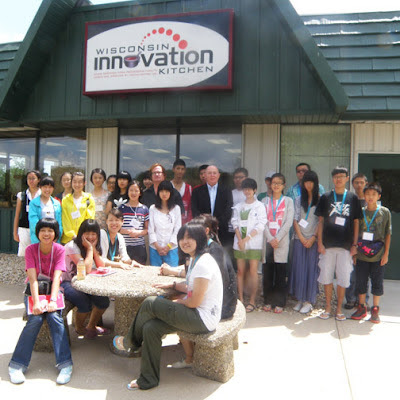 A group of over thirty Chinese students and teachers visited the Wisconsin Innovation Kitchen in Mineral Point July 26th during an 18-day tour of three Midwestern states. The Kitchen was on a prestigious list of about 35 places scheduled to be toured in Wisconsin, Iowa and Illinois from July 20 to August 6, as part of the educational "Rivers as Bridges" project between the U.S. and China. It focuses on using rivers -- the Mississippi and the Yangtze -- to connect culture, conservation and commerce between the two countries. Natural resources organizations in the Midwest states cooperated in sponsoring the event. Other stops included Northwestern University, The Field Museum, Chicago Metropolitan Water District, U.S. Geological Survey & Mississippi River lab, Mississippi River National Museum, Aqua Most Technology, Milwaukee School of Engineering, Wisconsin Department of Agriculture, Trade & Consumer Protection, Crave Farm, Horicon Marsh International Education Center, and Trees for Tomorrow. The list also included numerous colleges and universities including the UW-Madison Research Park, Edgewood College, and more. "It feels like quite a list to be on," said Rick Terrien, Executive Director of the Iowa County Area Economic Development Corporation (ICAEDC). The Innovation Kitchen is owned and operated by The Hodan Center in Mineral Point and was developed as a partnership between The Hodan Center and ICAEDC. The kitchen is a processing facility for small farms and small food businesses that want to make products in a government-inspected facility for sale on the open market. It gives small businesses access to the same clean, safe, certified processing as larger businesses at an affordable price. "Food in the Innovation Kitchen is prepared for sale across the U.S," Terrien explained. "The workers prepare recipes in small, affordable, commercial batches in their facility, which is state-of-the-art. The kitchen will help anyone living in the U.S. to start a food business." The Rivers to Bridges course is sponsored by the Environment and Public Health Network for Chinese Students and Scholars (ENCSS). The organization was formed at the UW-Madison in 2006 and is a not-for-profit 501 C 3 corporation with members in 23 states and 27 Chinese provinces. China's Vice-President Xi Jinping has called for innovative, people-to-people projects that emphasize mutual respect between the two cultures. Mr. Xi visited Muscatine, IA on the Mississippi in February, returning to the area and farm where he had lived as a foreign exchange student in his youth. He is quoted as saying to a Midwestern audience, "To me, you are America." A goal for Rivers as Bridges is to begin a youth-inspired relationship that can result in a renewal of the 1972 Shanghai Communique, a document signed by President Richard Nixon and Premier Zhou Enlai on Nixon's visit to China to seek normalization of relations. The goal is to renew the Shanghai Communique in 2022. The program hopes to establish long-term relationships that benefit the students, as well as encourage new business and government relationships since the youth will relay information they learn back to their family members and friends in China, according to Xiaojun Lu, president of ENCSS. The visiting students came from "key high schools," as identified by Chinese educational authorities. The rigorous course focuses on public health and the environment. Of particular interest were sponsors who could showcase or demonstrate processes and products that expose students to issues involved in environmental monitoring or corrective practices. "Environmental and public health problems are boundless, requiring a global exchange of information and experiences to solve them," said Lu. "Strategic measures to solve these common problems facing human beings include introducing key environmental and health issues to a younger generation across countries." "The Midwest is a prime spot for students to get this exposure," Lu said, adding that this inaugural program could lead to future exchanges of teachers, students and sponsors that benefit the Midwest as well as China. Lu feels that the focus on high school students is a logical next step to ensure the needed research skills, collaborative spirit and global outlook were developed in future generations. "At the Innovation Kitchen students saw a facility that helps small farms and food business successfully compete with firms that are much larger and how the kitchen, its employees and its clients contribute to a healthy rural community," Terrien explained. "Since the Innovation Kitchen is owned and operated by a center supporting persons with disabilities, it provides employment for persons with disabilities who demonstrate the capacity of all persons in society to contribute to its economic and social well-being," Terrien added. At the Kitchen, students learned about government food safety requirements that all businesses selling to the general public must meet, and the challenges facing small farms and businesses to meet those requirements. In addition, they learned about the Innovation Kitchen's services that help small businesses compete in the market and to start new businesses, and also about the contribution of small businesses and the Innovation Kitchen to local economies, sustainable agriculture, the hospitality industry, and healthy diets. Terrien became involved with the ENCSS and the Rivers as Bridges program two years ago when he was speaking in Iowa at a multi-state economic development conference, telling about work that is being done in Iowa County. "Two key people were in the audience," he said. "They pulled me aside and asked if the Innovation Kitchen would agree to be toured, to help teach people about safe, modern, regional food systems." Thank you again to the Dodgeville Chronicle and writer Jean Berns Jones for the great coverage! Original Dodgeville Chronicle story. Please patronize the Chronicle advertisers. ENCSS. Environment and Public Health Network for Chinese Students and Scholars. Thank you for a great visit! Thank you Illinois Farm Bureau!